Check it in [downloads] section. Tested on Mac Os X 10.5 and 10.6 for Intel and PowerPC on Reaper and Peak Bias as VST hosts. Next, I added some new parameters. 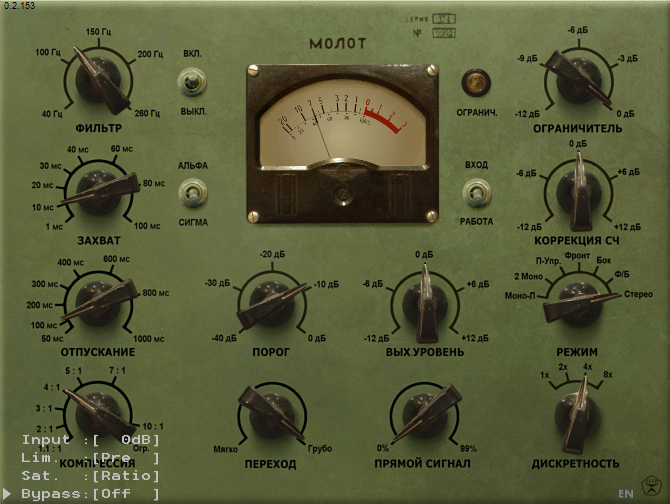 Molot was initially designed for input levels of -12 dbFS so you have 12 dB of headroom. If you have your levels for 0 dbFS or even more than that Molot can distort your sound. It is sometimes pleasant sometimes not. Now we have input gain control and built-in saturation can be turned off. By the way the saturation was always the part of Molot sound and saturation control was linked with “Ratio” knob. So the more ratio you set the more your sound was saturated. Now the saturation can be independent from ratio value. And finally you can place limiter at the end of signal chain or turn it off if you dislike it. NOTE #1. Only Windows version was updated. Mac version will be updated soon. Now it’s time to do some new plugins!